City Modern: Brush Park. Project Team: Hamilton Anderson Associates, Hunter Pasteur Homes, Christian Hurttienne Architects, Merge Architects, Studio Dwell, Lorcan O'Herlihy Architects. An alumnus of The Irwin S. Chanin School of Architecture of The Cooper Union, Maurice Cox is the director of planning and development for the City of Detroit. 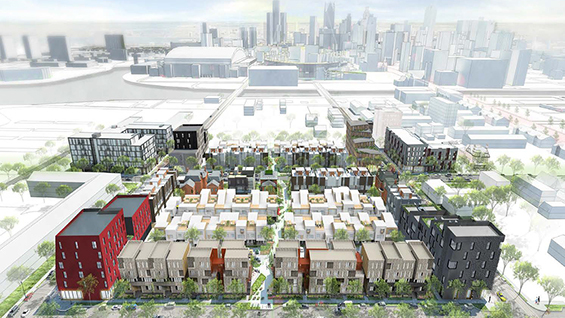 Post-bankruptcy Detroit is becoming a leading laboratory for urban regeneration, and Cox has earned widespread acclaim for his innovative role in this process. To reshape the city into a vibrant and dynamic place, Cox channels citizen participation into democratic practices while achieving the highest quality of design excellence. For Current Work, he will present a portfolio of City-commissioned work in landscape architecture, housing, and public space by some of the nation’s leading professionals.